Here’s a quiet bit of local knowledge: the theme parks on holidays like the Fourth of July, are hot and, especially, crowded. This year, try something different. Break out the lawn chairs and come on down to the Smoke on the Water celebration on the laid-back shores of Florida’s Space Coast. And if you find that we’ve steered you wrong (we haven’t, just trust us), worry not; those theme parks are a quick drive away, and they aren’t going anywhere. Saturday, July 2: The Cove at Port Canaveral. Fireworks to be fired over the harbor. Sunday, July 3: Cocoa Beach. Fireworks over the great blue expanse of the Atlantic Ocean, a stunning sight. Monday, July 4: Riverfront Park at Cocoa Village. Featuring the Brevard Symphony Orchestra and an epic fireworks show over the Indian River Lagoon. Why go anywhere else? Port Canaveral, Cocoa Beach, and Cocoa Village feature full days of entertainment and fun with the food and drink to match. 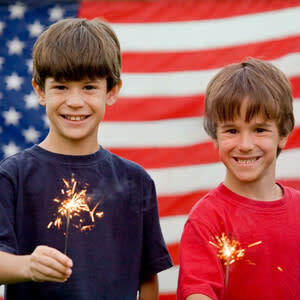 This is a celebration on Florida’s Space Coast for the Fourth of July that is truly unrivaled. All firework shows vary and take place over unique bodies of water, offering a different visual experience each night. Let’s give it all a quick rundown. The Cove at Port Canaveral, opening day, Saturday, July 2. Grills Seafood Deck & Tiki Bar: The deck out back features one of Port Canaveral’s best and most scenic tiki bars. Pull up a chair and watch the ships go by. Order any plate of seafood; it’s all great, but don’t miss out on the “Froiled” Lionfish. It’s a one-of-a-kind plate. Rusty&apos;s Seafood and Oyster Bar: A mainstay and staple for locals and vacationers alike, Rusty’s features some of the best fried seafood on the East Coast. If the view of the port isn’t spectacular enough, venture inside and gaze at walls of 42-inch high-definition flat screens. Fishlips Waterfront Bar & Grill: They have some terrific snow crab legs. And after the sun goes well down, there will be dancing upstairs. Oh yes, lots of dancing. Fishlips is a combination restaurant and party place. Wake up and shake the sand off; it’s Sunday, July 3. Florida’s Fresh Grill: The name kind of says it all. This place has fresh Florida seafood in a casual atmosphere with a tinge of the upscale. Main plates range from $18 to $35, and they offer a terrific wine menu as well. Beachside Grill & Deli: Grab something at the deli and run over to the beach. Beachside Grill & Deli is a great place to quickly load up the cooler and head over to the beach. They deliver, too. Monday, July 4 will be in historic and cozy downtown Cocoa Village. Murdock’s Southern Bistro: Murdock’s has both indoor and outdoor seating and is a mere block or so from the all-important water’s edge of the Indian River Lagoon. It’s hard to say if the music or the food is better, but it’s a good thought to try both. Ryan’s Pizza: This is the place to watch the fireworks boom over the lagoon. Get there early to stake out some position on the outdoor deck (the show will start just after dusk, which, in the summer, is about 9 p.m.) They offer a wide variety of beers on tap, paired with some unique pizza. Village Idiot Pub: A relative newcomer to the Cocoa Village area, the Village Idiot Pub is already becoming a favorite of the locals. The tap, with over a dozen beers, sets it apart, and you might need a growler in order to truly celebrate the Fourth of July in style. Add those three days together, in these three different exceptional areas, and you’ve truly had an incredible Fourth of July weekend on Florida’s Space Coast.